Here you’ll find all the Pennsylvania cities for which I have current fireworks display listings! If you don’t see any displays in your city or area yet, don’t worry – I’ll probably have it tomorrow. And you can always submit a display if I don’t have it! 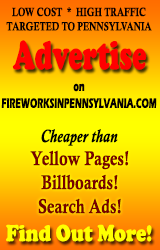 Remember – you can republish these listings if you like, but you must attribute them correctly and include a link to https://fireworksinpennsylvania.com. This is one of the more liberal copyright policies you’ll find on the web, but it is rigorously enforced. (And only fair – I did the work) More on the republishing policy.